Barnes and Noble has announced the latest addition to their line of Samsung branded Nook tablets with the release of the Samsung Galaxy Tab S2 Nook. The Tab S2 Nook is an 8-inch tablet with high-end specs. It has a Super AMOLED display with a resolution of 2048 x 1536 (320 ppi)—perfect for ereading. It’s Samsung’s thinnest and lightest tablet. It only weighs 9.3 ounces and is less than a quarter of an inch thick. This coincides with the release of the regular Samsung Galaxy Tab S2 tablet, which is the same exact device minus B&N’s preloaded apps (or bloatware, depending on how you look at it). The tablet runs Android 5.0 Lollipop. It has an octa-core processor, 3GB of RAM, 32GB of storage space, a microSD card slot, front and rear cameras, and a fingerprint scanner for added security. Battery life is an impressive 14 hours for video playback. The tablet also comes with Google Play, of course. B&N’s Nook branded version of the S2 tablet comes with a few perks, including the option to choose from some free Nook content, such as 3 books from a selection of 20, and three magazines from a selection of over 25 popular titles. 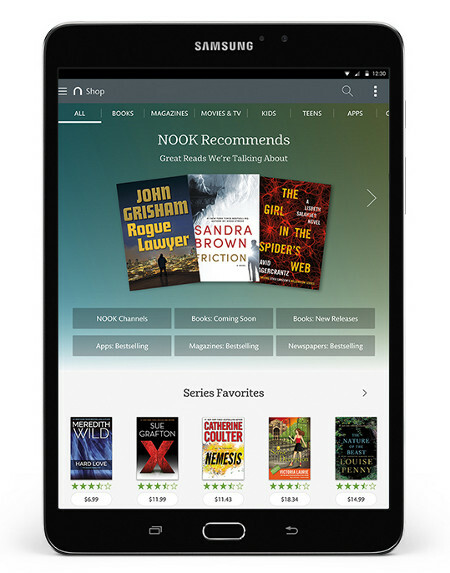 Customers also get a $5 credit for the Nook store. This is a really nice tablet, there’s no question about it. But the $399 price tag is going to be too much for most people, especially with similar tablets like the Asus ZenPad 8 that sells for half the price. It’s surprising that B&N has elected to go after the more competitive high-end market to compete with the likes of the iPad considering all the struggles they’ve endured in the tablet market. You’d think that B&N would release one of the less expensive Galaxy Tab A models as well for a lower price point, but it looks like they’re just going to keep the Galaxy Tab 4 Nooks around from last year instead as the lower-price alternatives. You would expect B&N to entice and try to win back their customers by offering a lower priced device. The tablet is nice but otherwise make no business sense. They already offer a lower priced device, the Tab 4 7″ for around $150. Also the Tab 4 10.1 for $250. This just adds a “premium” tablet to the lineup for those people who want an Ipad alternative. Your absolutely right John they did offer a lower priced Samsung Tab 4, and how did that work out for them? Last time I checked not too good as they almost went out of business. So the answer is to give the few customers they still have a $400 “premium” ipad alternative? How does that make business sense? B&N continues to make a profit, while Amazon continues to lose money every single year of its existence. So in spite of what the self-appointed “business experts” on this board may believe it’s actually fairly obvious which company is being well run. Any word on a new nook e-ink device? That’s too bad. I never upgraded to glow light because I heard it wasn’t as good. I was a Nook defender for quite a few years. Now I get most of my ebooks from Amazon. However, I do have the Glowlight and feel it’s quite decent. yeah, i’ve had nook since their first ereader and am at the point where if there isn’t a new and decent enough one soon, i’ll probably jump over to amazon. I had the Nook Tab 4 7″ for a few months, but the 8GB turned out to be a severe limitations if you like to install large apps and download music/video. Although the tablet has an micro-SD card slot, I found out that many apps cannot be moved to the SD card, and Nook books cannot be downloaded to the SD card either (at least not easily). The same is true for other ebook apps like Play Books and Kobo. I have some very large books because they are referenced books and textbooks. As result, I kept running low on internal storage space. I finally sold it and got a generic Samsung Tab 4 7″ with 16GB internal storage. That solved the storage problem. I just received notice that this tablet is on sale at B&N for $299. and the 10% member discount can also be used. I have a 15% coupon from B&N but I do’t know if I can use that one instead of or in addition to the membership offer. I put one on reserve so I will find out today. I am still using my first nook color that I bought for $249. and I think this will be great. My only question is whether Verizon will connect me.